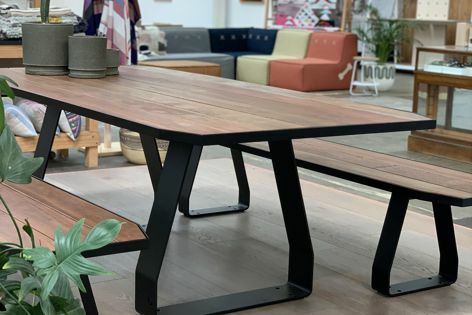 The Stirrup outdoor table has a strong steel frame and is designed to withstand harsh weather conditions. Stirrup is a stylish outdoor table consisting of two steel stirrups for the base and a tabletop with chamfered corner details. Assembled and disassembled with just a handful of screws, it’s a great option for spaces where accessibility is tricky or flexibility is required.